It's here, it's here!!!! 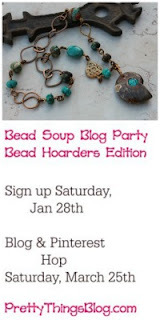 My Bead Soup Blog Party (BSBP) package arrived and I couldn't be more excited!!!! The BSBP is truly one of my favorite blogging activities! Created by the talented jewelry artist, Lori Anderson, the BSBP was on hiatus while Lori battled some health challenges. But I'm delighted to report the Party has been revived. I knew I was giving in the spirit of this theme, because I struggled a bit on whether I wanted to even give it away!! That said, I'm super happy that this pretty focal is going to get its due with the BSBP! 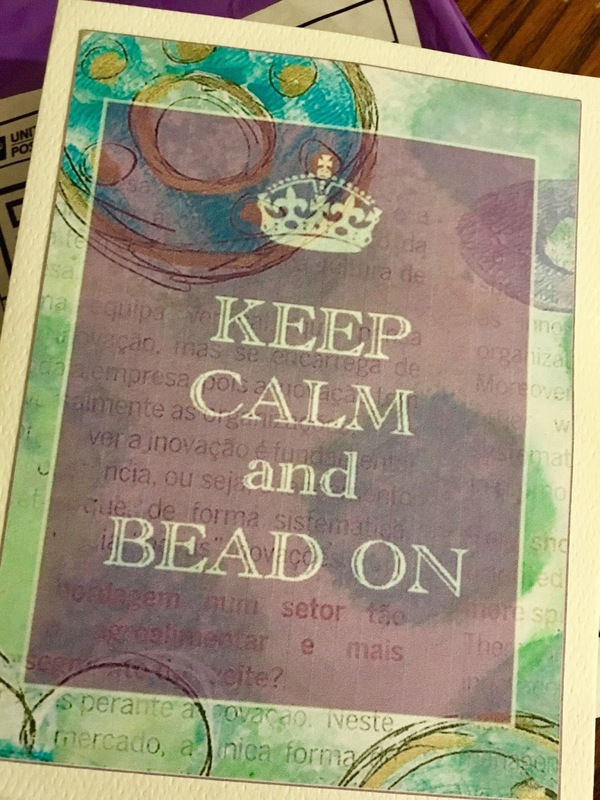 Now onto the bead soup that she sent me!!!!! Yippee! First of all.....how cute is this packaging!? Next: this card!!! Oh my goodness. LOVE! 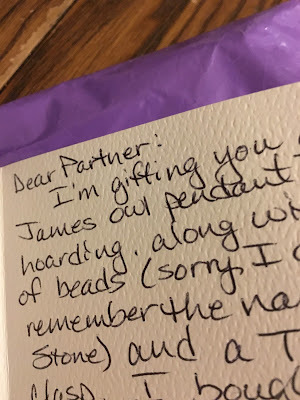 And anyone who has been reading my blog will know that my head just about exploded when I got to the part in the note about an "owl pendant"! WHAT!? Talk about synergy! I LOVE OWLS! In fact, just yesterday I trudged through a foot and a half of snow just to get a glimpse of my neighborhood great horned owl pair (as referenced in this post ), and saw Papa Owl fly away. At which time, I scanned the tree line for 30 minutes and took lots of pictures. Wasn't sure if I got anything (blame it on my middle aged eyes!) until I got back to my computer and was delighted to see I was aiming my camera just where I thought he perched! I LOVE IT! Thank you Sherri! 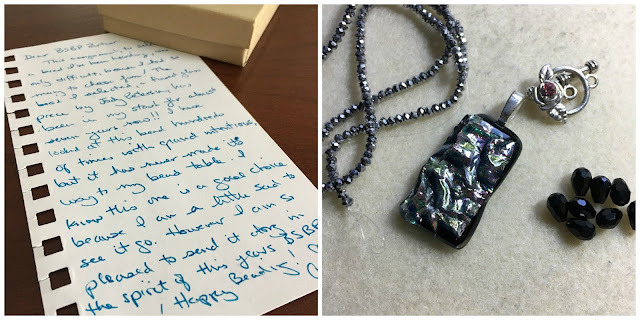 I am positively swooning over my pendant and beads. I love birds and especially owls, and this earthy color scheme is going to be tons of fun to work with! I can't wait to begin working on this! Come back on March 25th for the reveal party!!! Awesome soup! 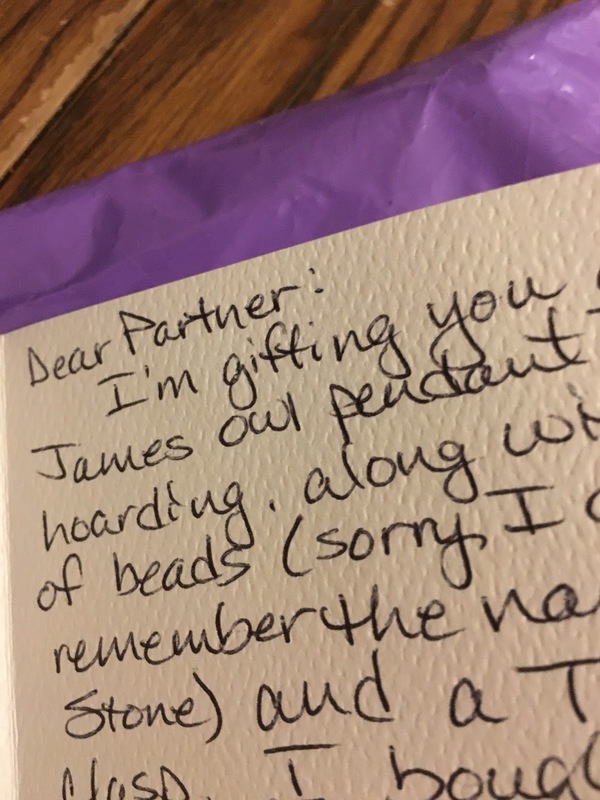 I love owlies too! Stinkin' cute or what! Look forward to the reveal! Awesome Amy, Sherri Stokey! I'm a big fan of her work also. 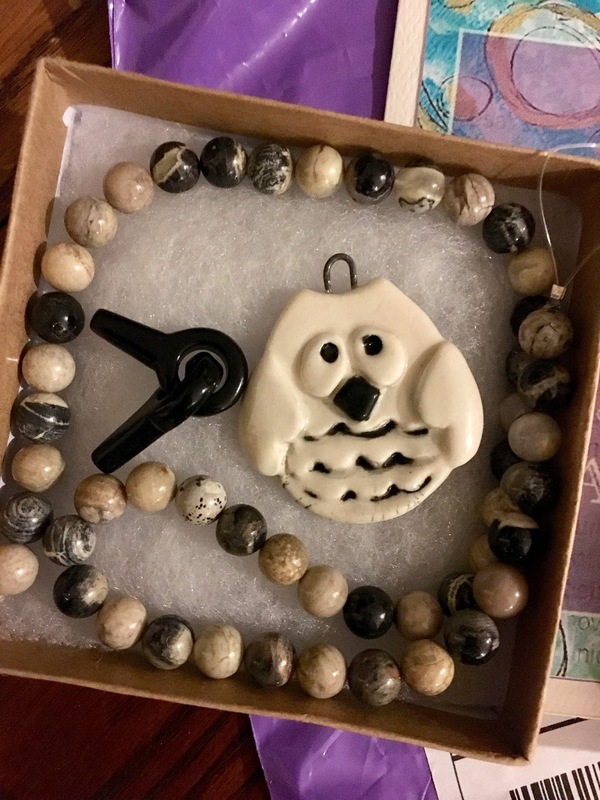 I know you will have fun creating something wonderful to show off the owl.